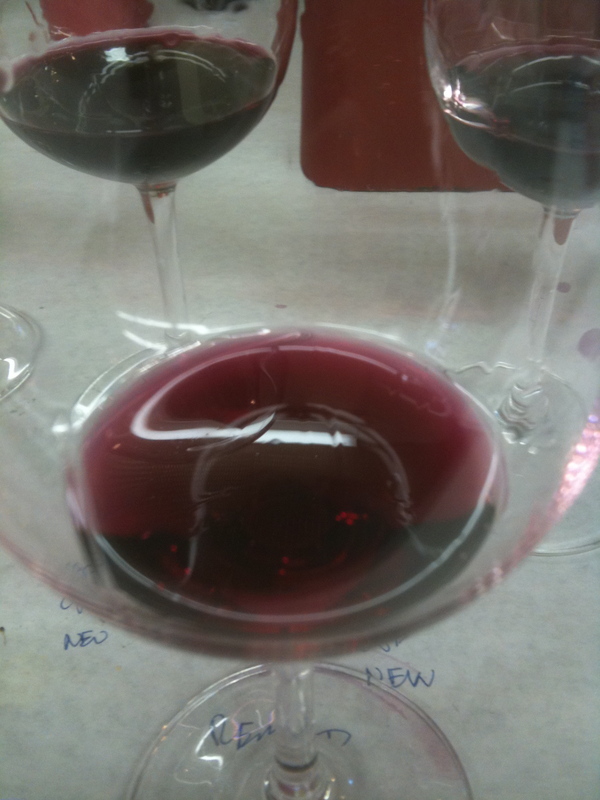 Twelve examples of pinot noir today, as I catch up on wines that I tasted throughout the last six months. This post is just the beginning. There will be at least one more in this particular series, a post devoted to pinot noir from Willamette Valley, and a series about individual wineries and producers. We range from Sta. Rita Hills in the south, in Santa Barbara County, to Anderson Valley in the north, in Mendocino. Ten of these wines rate Excellent, one Very Good+ and one Exceptional. The arrangement is alphabetical, not hierarchical. Enjoy! In moderation, of course. The weather outside may be frightful, but to sip a rosé wine is still delightful. These six examples can chase the mid-winter blues, not only with their delicate and elegant character but some with their savory elements of fruit compote, spice and earthiness. As usual with the Weekend Wine Notes, I eschew notations about history, geography and technical matters for the sake of quick and incisive mentions ripped, as it were, from the pages of my notebooks. Enjoy. Apaltagua Reserva Carmenere Rosé 2016, Maul Valley, Chile. 12.5% alc. Very pale coral-pink; delicately floral, delectably fruity (peach, strawberry), a fine-spun fabric of bright acidity and a scintillating limestone element; slightly earth finish. Delightful. About $13, representing Good Value. Global Vineyard Importers, Berkeley, Calif.
Sonoma-based Siduri Wines specializes in an array of single-vineyard pinot noirs from the range of West Coast regions. Winemaker and founder (in 1994) Adam Lee also produces pinot in broader appellation bottlings, which are the wines represented in today’s post, from Sta. Rita Hills (Santa Barbara County), Santa Lucia Highlands (Monterey County) and Yamhill-Carlton in Oregon’s Willamette Valley. The wines are finished unfined and unfiltered and topped with screw-caps for ease of opening. Lee and his wife and fellow-winemaker Dianna Novy Lee sold the winery to Jackson Family Wines in January 2015, though he remains as winemaker. These wines, which I found extremely pleasurable, were samples for review. Today’s Quick Sip features two wines from LaMontagne Winery. I was introduced to this winery through a virtual tasting put on by Protocol Wine Studio. 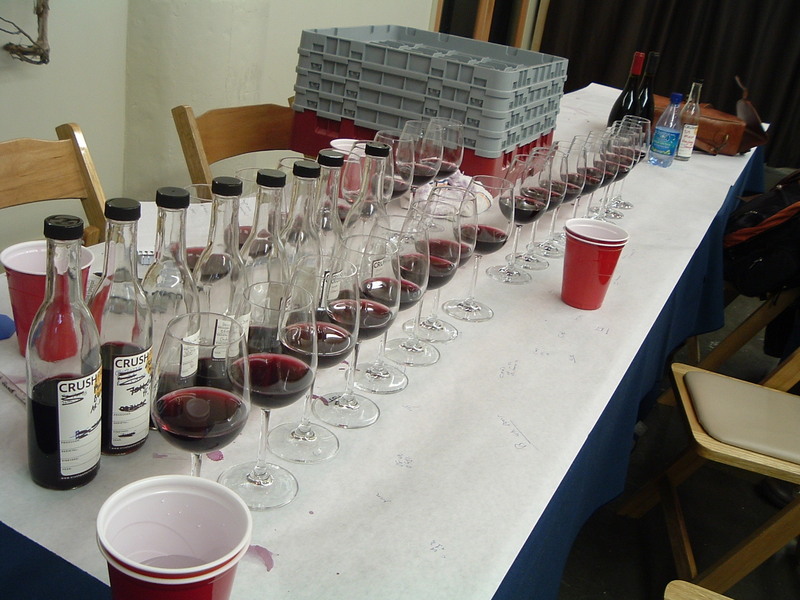 The tasting highlighted small-production Santa Barbara producers for the entire month of February. You can join Protocol Wine Studio’s wine themed conversation every Tuesday at 9PM EST by following #winestudio on Twitter. LaMontagne Winery was founded by foodie and wine lover, Kimberly Smith. Over the years, Kimberly had become quite fond of Pinot Noir, charmingly referred to as “the heartbreak grape,” for its temperament, fickleness, and delicacy. In 2006, that devotion led to college courses, hands-on-work at the highly-regarded Close Pepe Vineyard, and aspirants to become a winemaker. Her first vintage, which she says was an excellent growing season, would go into barrel in 2010. I recently had an opportunity to join the good folks at CellarPass for their 2014 kick-off episode which featured a live virtual tasting and interview with Steve Leveque, winemaker for Hall Wines in St Helena. Hall Wines is owned by Kathryn Hall and specializes in single-vineyard and limited-production wines with a focus on classic Bordeaux varieties. The tasting featured two Cabernet Sauvignons from Hall and a Pinot Noir from their WALT label. In this segment, we will focus on the Pinot Noir. The WALT label honors Kathryn’s parents, Bob and Dolores Walt – both dedicated winegrowers themselves. The WALT tasting room is located in Sonoma and specializes in crafting small-batches of Chardonnay and Pinot Noir from top sites along the Pacific Coast. 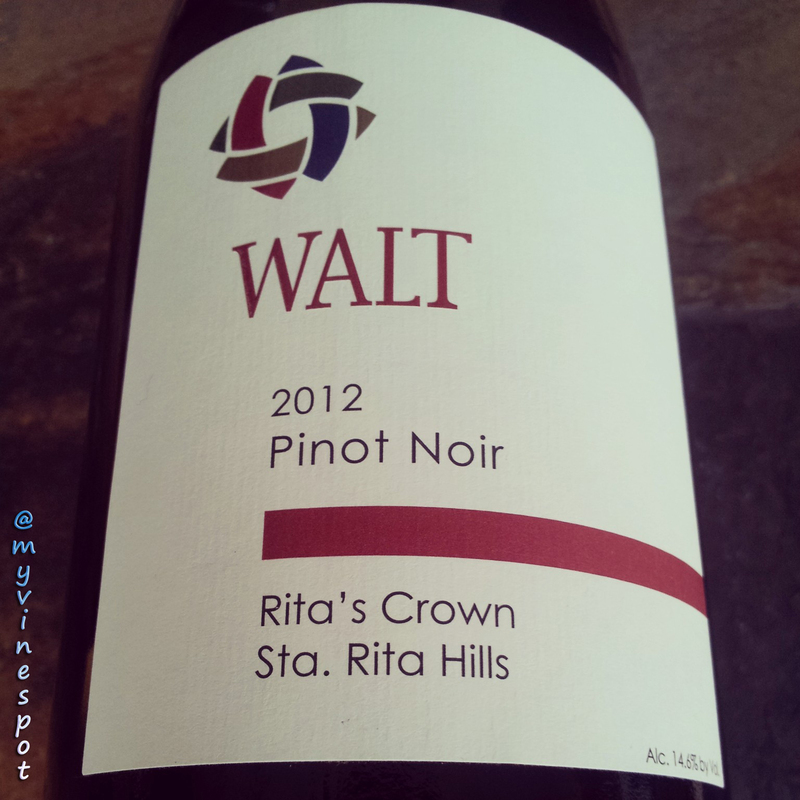 The wine I tasted was the WALT Rita’s Crown 2012 Sta. Rita Hills Pinot Noir. The Sta. Rita Hills is a sub-appellation located on the western end of the Santa Ynez Valley that’s making a name for itself with personality-driven Chardonnay and Pinot Noir wines. I have a feeling that old Miles, the pinotphile from Sideways, would really enjoy this wine. For further information and where you can find this selection, please see my tasting notes below. About CellarPass TV: #CellarPassTV is an informative weekly wine broadcast in which some of California’s top winemakers, winery owners, and people in the food and wine industry are interviewed by host Sarah Elliman. Their website, CellarPass.com, is a leading destination for online winery reservations that’s well worth checking out if you’re thinking about visiting California wine country. To view this episode of CellarPass TV, click here. Have a question about this post? Feel free to drop me an e-mail at myvinespot@yahoo.com or hit me up on Facebook or Twitter. Stay tuned …more to come. Happy Sipping, my friends! Disclosure: This wine was provided for review. Thoughts are my own. I recently had an opportunity to participate in a virtual “Tweet Jam” put on by Central Coast Wine and Food and Amy Corron Power, writer for Another Wine Blog. 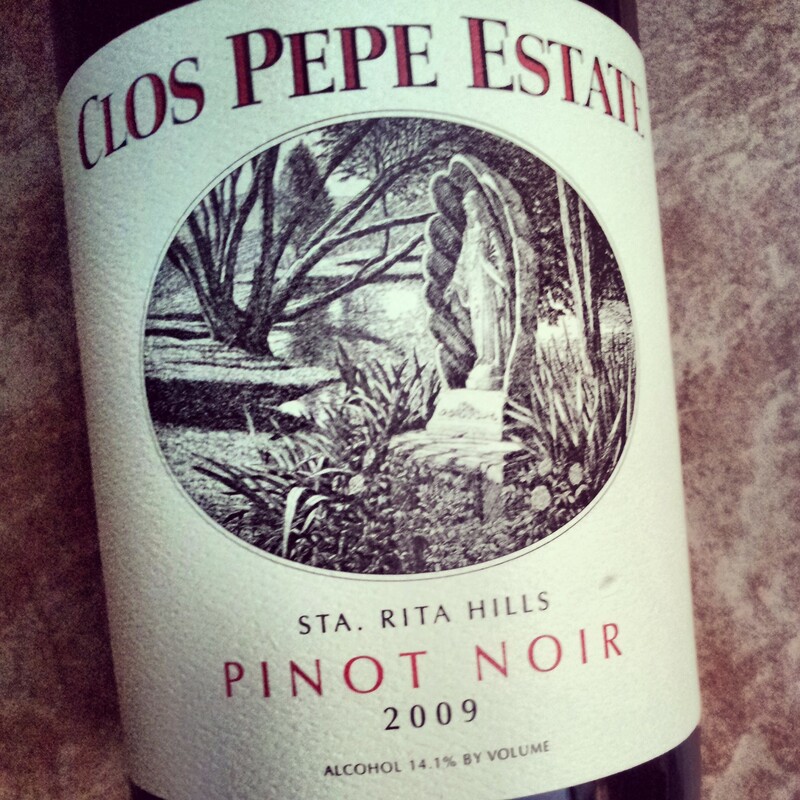 This Twitter-based tasting featured the Clos Pepe Estate Sta. Rita Hills’ 2009 Pinot Noir. Joining us online to answer questions, inform, and entertain, was Wes Hagen — vineyard manager and winemaker at Clos Pepe as well as a glowing YouTube personality. The catchy hash-tag we used for the Twitter tasting, #DirtDontLie, speaks to the producer’s minimal intervention approach to wine-making and desire to craft estate-grown wines that best express the vineyard, vintage, and grape variety. For Clos Pepe Vineyards and the Sta. Rita Hills appellation, those grape varieties are chiefly Chardonnay and Pinot Noir. The Sta. Rita Hills AVA (American Viticultural Area) is located in Santa Barbara and is part of the greater (and generally warmer) Santa Ynez Valley AVA. The Sta. Rita Hills has a moderating maritime influence and its cool [overall] macro-climate, ample sunshine, and long growing season are well-suited to Burgundy’s two key grape varieties. Wes wrote the original AVA petition and helped define the appellation’s boundaries. In 2001, the Sta. Rita Hills was officially recognized as an AVA. Since that time, area winegrowers, winemakers, farmers, and the quality of wine coming out of this small sub-appellation have assisted in putting the Sta. Rita Hills name on the Pinot Noir wine map – which, by the way, is fairly limited. Please see my tasting notes accompanied by a picture I snapped of the bottle and a link to the wine below. 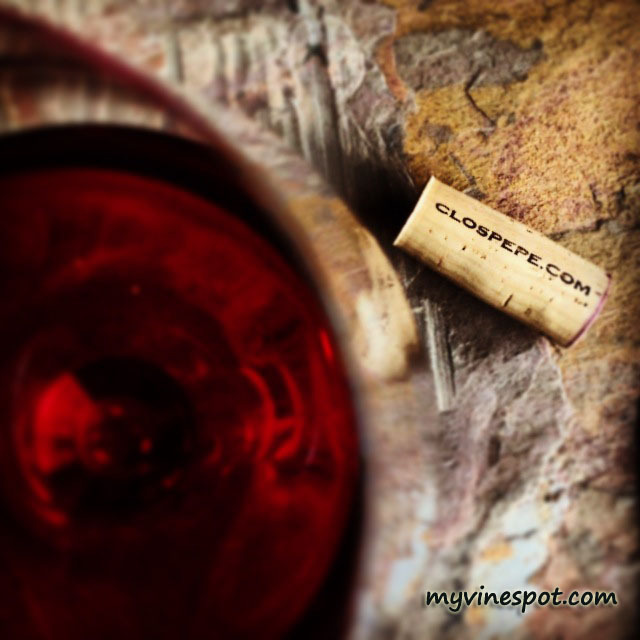 Review: Clos Pepe Sta. Rita Hills 2009 Estate Pinot Noir (SRP $62): This wine displays a beautiful (medium) crimson-garnet color in the glass with layers of fresh acidity over aromas of perfumed raspberry, black cherry, dried rose petals and brown spice with a trace of mineral undertones. The palate matches the nose with good depth of fruit, length, and a lovely texture. It’s drinking nicely now (especially with 30 to 45 minutes of air) and will continue to develop over time. Overall, this is a delicious and elegant Pinot Noir that begs for a table, good company, and a scrumptious meal (I’m thinking grilled lamb chops or seared duck breast). Approximately 900 cases of this wine were produced. (Other info: ABV 14.1%, cork enclosure.) 93 Points. Click here to find this wine. 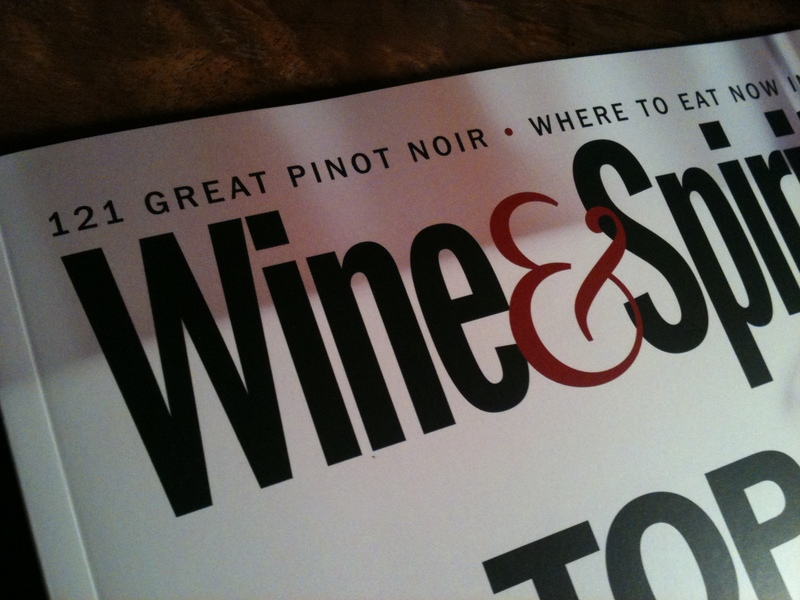 We’re very excited about the inclusion of two different Waits-Mast Pinot Noir wines in Wine & Spirits Magazine’s April 2012 issue that just came out on newsstands today. The magazine, which is geared towards restaurants and retailers as well as consumers, published its annual roundup of the “Year’s Best Pinot Noir”, looking at Pinot Noir from California and Oregon appellations. After tasting through 914 new-release Pinot Noirs over the last 12 months, its critics rated 121 as “exceptional” or 90+ pts and another 62 as “best buys”. 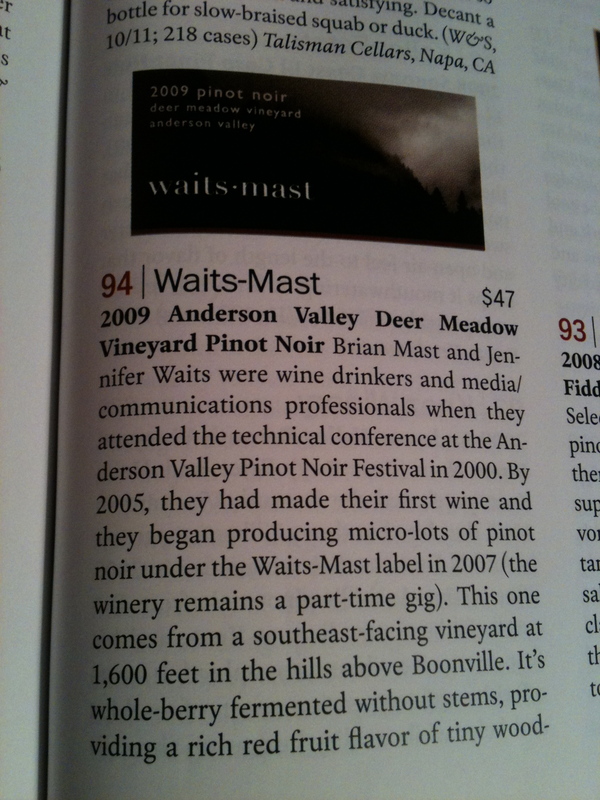 So, we’re super-pumped about making it into this short-list of great wines. The Wine & Spirits tasting process is pretty rigorous. It is double-blind, with a selection panel made up of sommeliers, winemakers, retailers and other wine industry folks tasting the first round and then recommending about 20-30% of the wines to get to the next round. In the next round, a Wine & Spirits critic reviews the wines again blind (from a second bottle provided by the winery), and writes up the review and decides on scores. More on their tasting process can be found here. For a super-small winery like ourselves to be included in this field of top producers, folks like Williams-Selyem, Hirsch, Flowers, Freestone and others is humbling and gratifying. We recommend that you go out and buy the hard copy of the magazine to see all the reviews and a great feature story on Anderson Valley. So, we’ll momentarily savor the reviews and the wonderful adjectives and then move on to our winemaking and other tasks. We also look forward to seeing the smiles of people tasting our wines at the upcoming events this spring and summer. 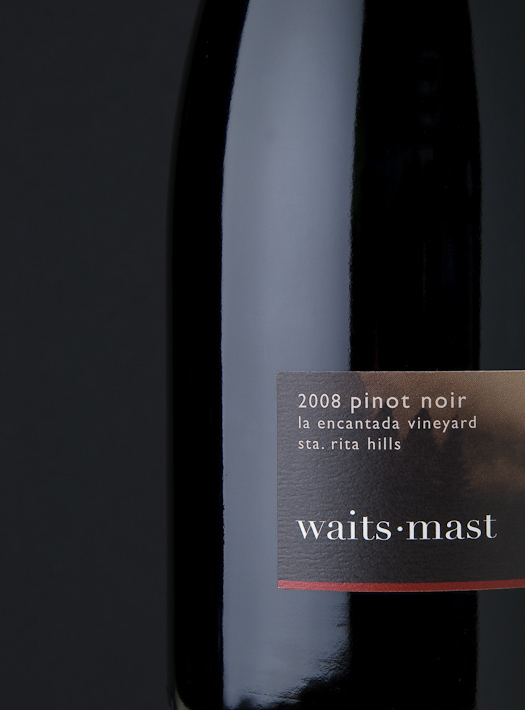 To keep things festive during this holiday season, Waits-Mast Family Cellars has put together a specially-priced three pack for California pinot noir fans, an appellation three pack. 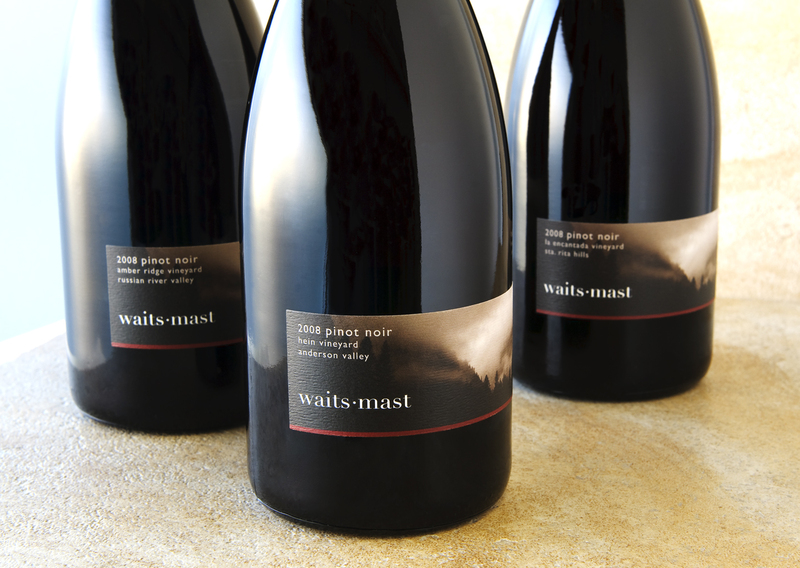 The three pack features a bottle of 2008 Waits-Mast Pinot Noir from three different regions: Anderson Valley, Russian River Valley and Sta. Rita Hills. 2008 Amber Ridge Vineyard, Russian River Valley: from Sonoma County. Silver Medal, 2010 San Francisco International Wine Competition; 87 points, Wine Enthusiast. 2008 La Encantada Vineyard, Sta. Rita Hills: from Santa Barbara County. Silver Medal, 2010 San Francisco International Wine Competition; 92 points, Wine Enthusiast. Read more about each wine here. The Appellation Three Pack is available through December 31, 2010. This three pack also qualifies for our holiday shipping special, too. So order today, using the coupon code HALF, and you’ll get 50% off ground shipping. To order, go to our purchase page here. Cheers! The Fall release from Waits-Mast Family Cellars is our second vintage from Richard Sanford’s La Encantada Vineyard in Sta. Rita Hills and the last of our three 2008 pinot noirs to be released. The 2008 La Encantada, bottled in September of 2009, is a well-structured wine. At first, it was tightly wound and needed some time. 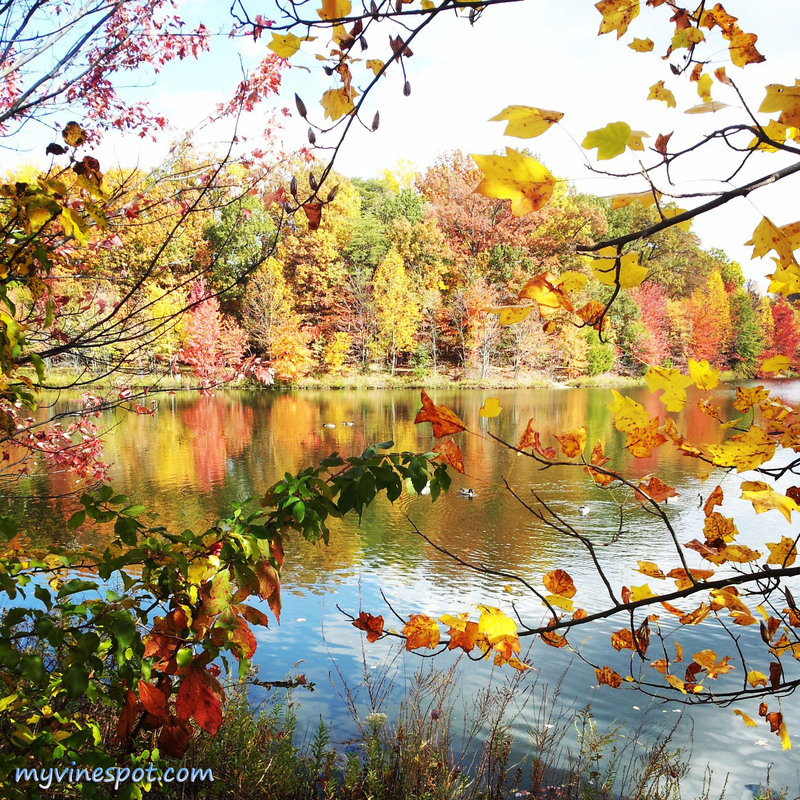 Now, a year later, it is unfolding and showing its colors and ready for your wine-drinking pleasure. When we brought the grapes in from harvest they were probably the most perfect clusters we had ever seen. Small, tight clusters with small berries. We knew then and there that this wine was going to be a cut above. No surprise, as this vineyard is well tended to by Sanford, and is certified organic by the California Certified Organic Farmers (CCOF). The hillside placement of this vineyard in the Sta. Rita Hills and the proximity to a mountain gap that exposes it to coastal fog and winds produces a low-vigor environment that delivers a lush cherry, raspberry and dark berry mix. Okay, so after all that build up, how does it taste? 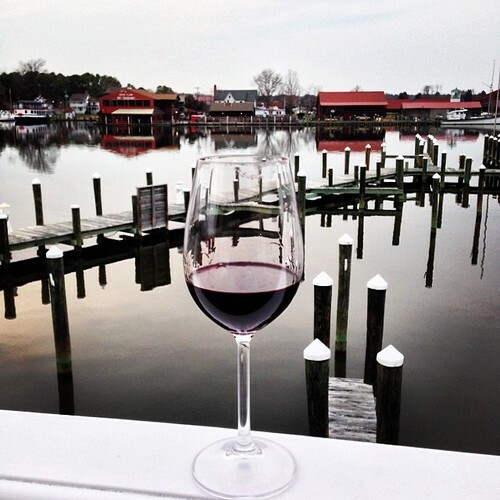 All in all, the best way to describe this wines is “well-rounded.” The aroma speaks of classic central/south coast pinot noir – cranberry, cherry, plum and a touch of forest floor. On the palate, an intense but brooding red and dark berry flavor unfolds, with fine tannins, slight minerality and nice acidity. At this point, all the flavors are starting to integrate quite well, so there’s a lot to ponder in that glass. With this type of structure and balance, it begs for food. One of our favorite dishes is a skirt steak simply marinated in garlic, soy sauce, maybe a touch of brown sugar and thrown on the grill. We also think that with Thanksgiving not far away, the cranberry and cherry notes in this wine will sing with your favorite holiday meal. Oh, and did we mention that this wine also won a Silver medal in the 2010 San Francisco International Wine Competition? To avail yourself of such a wonderful wine, you can go online today and purchase it in our webstore. If you are in the San Francisco Bay Area, you can find it at Pleasant Hill Wine Merchants and soon, other local retailers and restaurants. We also still have just a couple of cases left of our 2007 La Encantada, so start building your vertical (yes, we have a 2009 La Encantada still in barrel) now. Amber Ridge vineyard, Russian River Valley, Sonoma County (clones: 115, 667, 777; two barrels, one new (Francois Freres), one neutral): the first word I wrote down was “awesome.” The fruit leaps out of the glass and is juicy and dark, with a candied raspberry finish. This will mellow, for sure, but this will definitely be a wine that will be very drinkable, very soon. Deer Meadow Ranch vineyard, Anderson Valley, Mendocino County (clones: 115, Wadenswil; two barrels, one new (Cadus), one neutral): This is Rich Savoy’s higher elevation (1600 ft.) vineyard (official vineyard designation to-be-named) in Boonville. We’ve tasted this twice in the last month and we are very excited about this one. We feel it will deliver that complex, earthy Anderson Valley pinot noir that we love so much. Definitely some funky earth on the nose, with a mix of red and dark fruit. The tight-grained French Cadus oak is very restrained on the nose. Oppenlander vineyard, Comptche, Mendocino County (clones: 114; two barrels, one new (Remond), one neutral): Whoa! Crazy violet-tinged color on this one. I remember that color from the bottom of the bin after we dumped the grapes into the press. Chris Nelson, our winemaker, said the Oppenlander shows some of that classic “oceanic acidity.” Indeed, and some firm tannins, too. This will be a vibrant wine and we’re eager to see how it progresses as it comes together. Hayley’s vineyard, Anderson Valley, Mendocino County (clones: 114; one barrel, 33% new French oak, Francois Freres): Hayley’s is on the valley floor, or benchland, where a lot of fog sits late into the morning. A lighter wine in comparison to some of the others, with nice red cherry fruit. Floral on the nose, with a distinct wild vanilla and coconut aroma, reminiscent of Malibu Rum (oh, the days of yore…). La Encantada vineyard, Sta. Rita Hills, Santa Barbara County (clones:115, 777; one barrel, 33% new French oak, Francois Freres): last but not least, this 100% organic vineyard always delivers beautiful and exciting wines. The 2009, our third vintage in a row with La Encantada, is showing an exotic herbal and spicy nose (consistent with previous vintages) and nice tannins. Should be another winner – so far, so good! We’ll be back with more barrel tasting notes throughout the spring and summer and remember, we still have two different 2008 pinot noirs yet to be released. So stay tuned to our blog or sign up at our website to get on our mailing list for the latest news.